Beginning in May 1974, a wave of strikes hit Rangoon and elsewhere in the country against a backdrop of corruption, inflation and food shortages, especially rice. In Rangoon workers were arrested at the Insein railway yard, and troops opened fire on workers at the Thamaing textile mill and Simmalaik dockyard. In December 1974, the biggest anti-government demonstrations to date broke out over the funeral of former UN Secretary-General U Thant. U Thant had been former prime minister U Nu's closest advisor in the 1950s and was seen as a symbol of opposition to the military regime. The Burmese people felt that U Thant was denied a state funeral that he deserved as a statesman of international stature because of his association with U Nu. On 23 March 1976, over 100 students were arrested for holding a peaceful ceremony (Hmaing yabyei) to mark the centenary of the birth of Thakin Kodaw Hmaing who was the greatest Burmese poet and writer and nationalist leader of the 20th. century history of Burma. He had inspired a whole generation of Burmese nationalists and writers by his work mainly written in verse, fostering immense pride in their history, language and culture, and urging them to take direct action such as strikes by students and workers. It was Hmaing as leader of the mainstream Dobama who sent the Thirty Comrades abroad for military training, and after independence devoted his life to internal peace and national reconciliation until he died at the age of 88 in 1964. Hmaing lies buried in a mausoleum at the foot of the Shwedagon Pagoda. A young staff officer called Captain Ohn Kyaw Myint conspired with a few fellow officers in 1976 to assassinate Ne Win and San Yu, but the plot was uncovered and the officer tried and hanged. In 1978, a military operation was conducted against the Rohingya Muslims in Arakan, called the King Dragon operation, causing 250,000 refugees to flee to neighboring Bangladesh. U Nu, after his release from prison in October 1966, had left Burma in April 1969, and formed the Parliamentary Democracy Party (PDP) the following August in Bangkok, Thailand with the former Thirty Comrades, Bo Let Ya, co-founder of the CPB and former Minister of Defence and deputy prime minister, Bo Yan Naing, and U Thwin, ex-BIA and former Minister of Trade. Another member of the Thirty Comrades, Bohmu Aung, former Minister of Defence, joined later. The fourth, Bo Setkya, who had gone underground after the 1962 coup, died in Bangkok shortly before U Nu arrived. The PDP launched an armed rebellion across the Thai border from 1972 till 1978 when Bo Let Ya was killed in an attack by the Karen National Union (KNU). U Nu, Bohmu Aung and Bo Yan Naing returned to Rangoon after the 1980 amnesty. Ne Win also secretly held peace talks later in 1980 with the KIO and the CPB, again ending in a deadlock as before. Ne Win retired as president in 1981, but remained in power as Chairman of the BSPP until his sudden unexpected announcement to step down on 23 July 1988. In the 1980s, the economy began to grow as the government relaxed restrictions on foreign aid, but by the late 1980s falling commodity prices and rising debt led to an economic crisis. This led to economic reforms in 1987–88 that relaxed socialist controls and encouraged foreign investment. This was not enough, however, to stop growing turmoil in the country, compounded by periodic 'demonetization' of certain bank notes in the currency, the last of which was decreed in September 1987 wiping out the savings of the vast majority of people. In September 1987, Burma's de facto ruler U Ne Win suddenly canceled certain currency notes which caused a great down-turn in the economy. The main reason for the cancellation of these notes was superstition on U Ne Win's part, as he considered the number nine his lucky number—he only allowed 45 and 90 kyat notes, because these were divisible by nine. (BBC News Website, http://news.bbc.co.uk/2/hi/asia-pacific/7012158.stm (Bilal Arif) Burma's admittance to Least Developed Country status by the UN the following December highlighted its economic bankruptcy. Triggered by brutal police repression of student-led protests causing the death of over a hundred students and civilians in March and June 1988, widespread protests and demonstrations broke out on 8 August throughout the country. The military responded by firing into the crowds, alleging Communist infiltration. Violence, chaos and anarchy reigned. Civil administration had ceased to exist, and by September of that year, the country was on the verge of a revolution. The armed forces, under the nominal command of General Saw Maung staged a coup on 8 August to restore order. During the 8888 Uprising, as it became known, the military killed thousands. The military swept aside the Constitution of 1974 in favor of martial law under the State Law and Order Restoration Council (SLORC) with Saw Maung as chairman and prime minister. At a special six-hour press conference on 5 August 1989, Brig. Gen. Khin Nyunt, the SLORC Secretary 1 and chief of Military Intelligence Service (MIS), claimed that the uprising had been orchestrated by the Communist Party of Burma through its underground organisation. Although there had inevitably been some underground CPB presence as well as that of ethnic insurgent groups, there was no evidence of their being in charge to any extent. In fact, in March 1989, the CPB leadership was overthrown by a rebellion by the Kokang and Wa troops that it had come to depend on after losing its former strongholds in central Burma and re-establishing bases in the northeast in the late 1960s; the Communist leaders were soon forced into exile across the Chinese border. 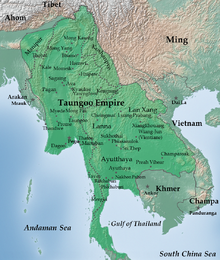 The military government announced a change of name for the country in English from Burma to Myanmar in 1989. It also continued the economic reforms started by the old regime and called for a Constituent Assembly to revise the 1974 Constitution. This led to multiparty elections in May 1990 in which the National League for Democracy (NLD) won a landslide victory over the National Unity Party (NUP, the successor to the BSPP) and about a dozen smaller parties. The military, however, would not let the assembly convene, and continued to hold the two leaders of the NLD, U Tin U and Aung San Suu Kyi, daughter of Aung San, under house arrest imposed on them the previous year. Burma came under increasing international pressure to convene the elected assembly, particularly after Aung San Suu Kyi was awarded the Nobel Peace Prize in 1991, and also faced economic sanctions. In April 1992 the military replaced Saw Maung with General Than Shwe. Than Shwe released U Nu from prison and relaxed some of the restrictions on Aung San Suu Kyi's house arrest, finally releasing her in 1995, although she was forbidden to leave Rangoon. Than Shwe also finally allowed a National Convention to meet in January 1993, but insisted that the assembly preserve a major role for the military in any future government, and suspended the convention from time to time. The NLD, fed up with the interference, walked out in late 1995, and the assembly was finally dismissed in March 1996 without producing a constitution. During the 1990s, the military regime had also had to deal with several insurgencies by tribal minorities along its borders. General Khin Nyunt was able to negotiate cease-fire agreements that ended the fighting with the Kokang, hill tribes such as the Wa, and the Kachin, but the Karen would not negotiate. The military finally captured the main Karen base at Manerplaw in spring 1995, but there has still been no final peace settlement. Khun Sa, a major opium warlord who nominally controlled parts of Shan State, made a deal with the government in December 1995 after U.S. pressure. After the failure of the National Convention to create a new constitution, tensions between the government and the NLD mounted, resulting in two major crackdowns on the NLD in 1996 and 1997. The SLORC was abolished in November 1997 and replaced by the State Peace and Development Council (SPDC), but it was merely a cosmetic change. Continuing reports of human rights violations in Burma led the United States to intensify sanctions in 1997, and the European Union followed suit in 2000. The military placed Aung San Suu Kyi under house arrest again in September 2000 until May 2002, when her travel restrictions outside of Rangoon were also lifted. Reconciliation talks were held with the government, but these came to a stalemate and Suu Kyi was once again taken into custody in May 2003 after an ambush on her motorcade reportedly by a pro-military mob. The government also carried out another large-scale crackdown on the NLD, arresting many of its leaders and closing down most of its offices. The situation in Burma remains tense to this day. In August 2003, Kyin Nyunt announced a seven-step "roadmap to democracy", which the government claims it is in the process of implementing. There is no timetable associated with the government’s plan, or any conditionality or independent mechanism for verifying that it is moving forward. For these reasons, most Western governments and Burma's neighbors have been skeptical and critical of the roadmap. On 17 February 2005, the government reconvened the National Convention, for the first time since 1993, in an attempt to rewrite the Constitution. However, major pro-democracy organisations and parties, including the National League for Democracy, were barred from participating, the military allowing only selected smaller parties. It was adjourned once again in January 2006. 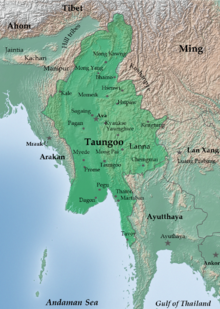 In November 2005, the military junta started moving the government away from Yangon to an unnamed location near Kyatpyay just outside Pyinmana, to a newly designated capital city. This public action follows a long term unofficial policy of moving critical military and government infrastructure away from Yangon to avoid a repetition of the events of 1988. On Armed Forces Day (27 March 2006), the capital was officially named Naypyidaw Myodaw (lit. Royal City of the Seat of Kings). In 2005, the capital city was relocated from Yangon to Naypyidaw. In November 2006, the International Labour Organization (ILO) announced it will be seeking – at the International Court of Justice. – "to prosecute members of the ruling Myanmar junta for crimes against humanity" over the continuous forced labour of its citizens by the military. According to the ILO, an estimated 800,000 people are subject to forced labour in Myanmar. 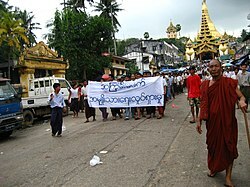 The 2007 Burmese anti-government protests were a series of anti-government protests that started in Burma on 15 August 2007. The immediate cause of the protests was mainly the unannounced decision of the ruling junta, the State Peace and Development Council, to remove fuel subsidies which caused the price of diesel and petrol to suddenly rise as much as 100%, and the price of compressed natural gas for buses to increase fivefold in less than a week. The protest demonstrations were at first dealt with quickly and harshly by the junta, with dozens of protesters arrested and detained. Starting 18 September, the protests had been led by thousands of Buddhist monks, and those protests had been allowed to proceed until a renewed government crackdown on 26 September. During the crack-down, there were rumors of disagreement within the Burmese military, but none were confirmed. At the time, independent sources reported, through pictures and accounts, 30 to 40 monks and 50 to 70 civilians killed as well as 200 beaten. However, other sources reveal more dramatic figures. In a White House statement President Bush said: "Monks have been beaten and killed.... Thousands of pro-democracy protesters have been arrested". Some news reports referred to the protests as the Saffron Revolution. On 7 February 2008, SPDC announced that a referendum for the Constitution would be held, and Elections by 2010. The Burmese constitutional referendum, 2008 was held on 10 May and promised a "discipline-flourishing democracy" for the country in the future. On 3 May 2008, Cyclone Nargis devastated the country when winds of up to 215 km/h (135 mph) touched land in the densely populated, rice-farming delta of the Irrawaddy Division. It is estimated that more than 130,000 people died or went missing and damage totalled 10 billion dollars (US$); it was the worst natural disaster in Burmese history. The World Food Programme report that, "Some villages have been almost totally eradicated and vast rice-growing areas are wiped out." The United Nations estimates that as many as 1 million were left homeless and the World Health Organization "has received reports of malaria outbreaks in the worst-affected area." 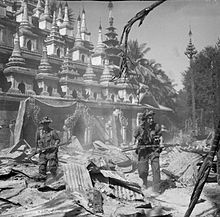 Yet in the critical days following this disaster, Burma's isolationist regime complicated recovery efforts by delaying the entry of United Nations planes delivering medicine, food, and other supplies. The government's failure to permit entry for large-scale international relief efforts was described by the United Nations as "unprecedented." The 2011–2012 Burmese democratic reforms are an ongoing series of political, economic and administrative reforms in Burma undertaken by the military-backed government. These reforms include the release of pro-democracy leader Aung San Suu Kyi from house arrest and subsequent dialogues with her, establishment of the National Human Rights Commission, general amnesties of more than 200 political prisoners, institution of new labor laws that allow labor unions and strikes, relaxation of press censorship, and regulations of currency practices. As a consequence of the reforms, ASEAN has approved Burma's bid for the chairmanship in 2014. United States Secretary of State Hillary Clinton visited Burma on 1 December 2011, to encourage further progress; it was the first visit by a Secretary of State in more than fifty years. United States President Barack Obama visited one year later, becoming the first US president to visit the country. Suu Kyi's party, the National League for Democracy, participated in by-elections held on 1 April 2012 after the government abolished laws that led to the NLD's boycott of the 2010 general election. She led the NLD in winning the by-elections in a landslide, winning 41 out of 44 of the contested seats, with Suu Kyi herself winning a seat representing Kawhmu Constituency in the lower house of the Burmese Parliament. However, uncertainties exist as some other political prisoners have not been released and clashes between Burmese troops and local insurgent groups continue.